Year of service? Grad school? Job? Did God seem to tap you on the shoulder and say, I think you can do this year of service? 1. Invite God to help your thinking and the movements of your heart. 2. Try to maintain an attitude of indifference, meaning you want to be willing to do whatever or go wherever God seems to be drawing you. 3. Do your homework. Get adequate information on all the options that draw you. 5. Be alert to little “nudges,” little things that cause you to think of one option over another. 6. Journal these “nudges” – write them down. 9. Where do you feel most drawn? it is that draws you the most. 11. Don’t pore over or question what you write, just write down all your reasons. feel draws you the most. Don’t censor your ideas, just write. 13. When finished, pause, stand up, walk around, come back and review what you have written. 15. If your reasons “not to” are more convincing, begin the process all over and move onto your next alternative. When you have reached a point where you believe you have sufficient information about your options — job, volunteer service, or grad school, and you have read your materials, you are ready to begin your discernment. How do I know what to do NEXT YEAR? 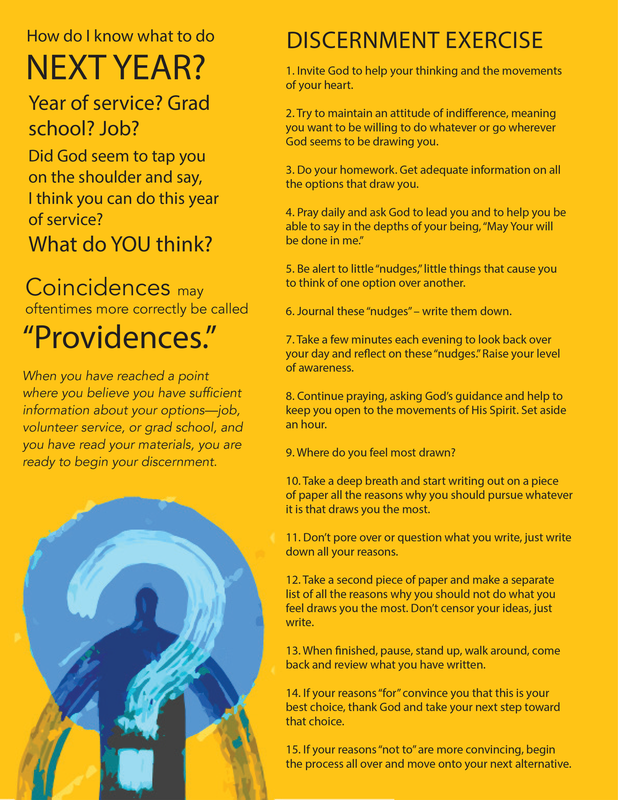 Coincidences may oftentimes more correctly be called “Providences.